Imagine sitting all day in a cramped, stuffy bedroom. The lighting is constantly dim, lulling you into a kind of dazed stupor. Everything gets more and more confusing, names and memories flickering in and out of your head like reflections in a moving stream. Everyone talks too fast and too quietly, and you exhaust yourself straining to hear them. Your hands shake. The only clothes you can put on without help are shapeless sweatpants and floppy slippers, so you live with the chronic embarrassment of feeling sloppy and underdressed. Moving is slow and painful: the best you can manage is a slow, crouching shuffle hunched over a walker. Now imagine spending 10 years of your life in that room, getting progressively sicker and weaker. Imagine your confusion as you’re put on and taken off different medications that make you more or less drowsy and foggy. Imagine watching the people around you die and knowing you’re just in there serving time before the same thing happens to you. If you’re lucky, you have family or friends who come to visit you. But there’s also a good chance that you don’t. It’s not a pretty picture, but the important thing to remember about this image of growing old is that it doesn’t have to be this way. 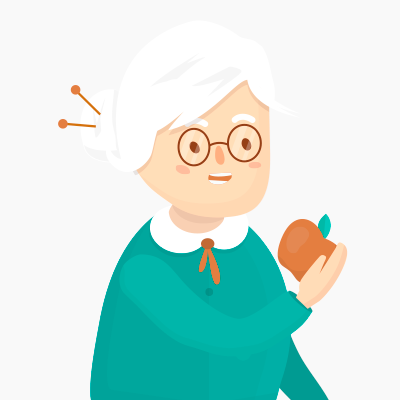 Aging does involve an inevitable decline in function, sometimes accompanied by painful chronic illnesses, but the diet and lifestyle we prescribe for elderly patients adds on a completely unnecessary degree of trauma and illness. There’s an alternative to years of increasing isolation spent enduring a slow physical and mental degeneration. This article takes a look at the role of diet and lifestyle in the aging process: how modern culture makes it so much more painful, and how Paleo can help. First of all, remember that all the myths about how “cavemen died young” are just that: myths. When you take out the high infant mortality rate (due to lack of antibiotics to treat infectious diseases like pneumonia or strep throat) and look at life expectancy past age 10 or so, cavemen didn’t die particularly young at all – or if they did, it was from inter-group warfare, not disease. So there’s no truth to the accusation that a Paleo diet will make you drop dead at 25. In fact, it’s precisely in middle age when a Paleo diet really starts showing its benefits. It’s common knowledge that as human beings age, our ability to “get away with” a bad diet decreases. A 20-year-old athlete can live on Hot Pockets and instant noodles without obvious ill effects, but carrying that kind of diet over into his 30s and 40s will lead to rapid and unpleasant physical deterioration. Logically, this means that the older we get, the more important it is to eat well. One evolutionary theory explaining this is that the elderly are even more vulnerable to damage from modern foods, because they aren’t under the same evolutionary pressure as the young to adapt to them. In traditional societies, the elderly make a mostly cultural contribution, rather than a physical one. It might be beneficial for the group if a 55-year-old woman survives (so she can help her daughters with their children), but that woman doesn’t have to be in excellent health because her body is no longer required to go through pregnancy and childbirth. Because the elderly aren’t under such selective pressure to be in optimum physical health, it’s possible that people who have passed reproductive age have even more trouble digesting grains and legumes. In the same way that many adults cannot digest milk after childhood (they lose the ability because they simply didn’t need it), the elderly might “turn off” certain digestive adaptations that allow younger people to survive on a suboptimal diet. This would save some physical energy for more important needs, like maintaining brain function. In any case, whether there’s an evolutionary reason, or whether it’s just the normal “winding down” of the human body, older adults clearly stand to benefit from optimal nutrition, and have a lot to lose from a diet full of processed food and low in nutrient content. So how does Paleo stack up against the nutritional needs of aging adults? First, Paleo is beneficial because it delivers a lot of nutrients per calorie. The loss of muscle mass during aging means that the basal metabolic rate (the number of calories needed just to survive) also drops: older people need less energy, but the same amount of nutrients, as younger people. It’s possible to preserve some muscle mass with exercise (discussed below) but ultimately some degree of age-related metabolic slowdown is just a fact of life. From a dietary standpoint, this means that the ideal diet for slowing the aging process should be as nutrient-dense as possible. There should be no “wasted calories” that don’t provide anything of nutritional value. Sugar features prominently as a culprit, but all those “heart-healthy whole grains” also count, since the nutrients in them are so bound up with antinutrients that they aren’t very bioavailable. Reducing or cutting down on these empty calories and filling their place with nutrient-dense whole foods can help prevent a lot of dangerous complications often associated with old age. For example, one of the most common chronic conditions in older men and postmenopausal women is osteoporosis, a gradual reduction in bone density that can leave patients at risk for mobility-limiting fractures. The standard prescription for osteoporosis is to get more calcium by eating plenty of dairy, but this doesn’t quite work out, since the countries with the highest dairy intakes (like the US) also have extremely high rates of osteoporosis, while countries with lower dairy intakes (like Japan) have lower rates. Even accounting for calcium-rich non-dairy foods like seaweed, clearly something is going on besides the simple amount of calcium consumed. That “something” is probably all the other nutrients needed to absorb and use calcium, like Vitamin D and Magnesium. Calcium doesn’t magically get shuttled straight from your mouth to your bones: without these essential cofactors, it won’t get there at all. A diet rich in all the necessary micronutrients, and low in the toxins that impair absorption, is much better for preventing osteoporosis than a diet overloaded with calcium but lacking everything else. And for that need, Paleo fits the bill exactly. Other nutrient deficiencies common among older adults include Vitamin B12 deficiency (a major contributor to dementia and other neurological diseases) and iron deficiency (which causes inexplicable fatigue and brain fog). High-quality animal products, the nutritional core of Paleo, are excellent sources of both of these nutrients. Without getting into a detailed description of every potential nutrient deficiency brought on by a diet of mashed potatoes and prunes, it’s clear that Paleo fills the nutritional needs of the elderly in a way the standard American diet simply doesn’t. Since Paleo provides high levels of all the essential nutrients with few or no empty calories, it’s ideal for meeting the dietary needs of the elderly, who need just as many vitamins and minerals as their younger selves, but have to get them in less food overall. Paleo is also advantageous compared to the USDA-recommended diet because it’s beneficial for insulin sensitivity, which makes it very therapeutic for one of the most common complications of aging: insulin resistance. Insulin resistance, when the body can no longer properly metabolize carbohydrates, is a precursor to Type 2 diabetes, a problem much more common among the elderly than in the general population. Around 27% of all adults over 65 suffer from diabetes, compared to around 8% of the US population. The complications of diabetes include kidney disease and loss of vision; more frighteningly, they can also contribute to chronic neurological diseases. One of the most feared diseases of aging is Alzheimer’s disease, a steady loss of brain function marked by increasing memory loss and confusion. Anyone who’s taken care of a loved one suffering from Alzheimer’s disease knows how painful this is, not only to the patient, but also to his or her family and friends. The researchers started by noting what we already know: the elderly tend to have decreased insulin sensitivity as they age. Insulin signaling is important for forming memories, so a high-carb diet would be a prime suspect in memory loss for this reason alone. But there’s also another connection to diet in the form of cholesterol. People with low serum cholesterol levels have higher levels of neurodegenerative diseases like Alzheimer’s, Parkinson’s Disease, and dementia. It’s not simply about eating more cholesterol, either, since a healthy metabolism can keep blood cholesterol regulated despite a widely varying intake. Really, the problem is with the digestion and use of the cholesterol you do get. In this case, the researchers found that high fructose consumption promotes the formation of advanced glycation end-products (AGEs), which prevent the brain from using LDL cholesterol properly. This suggests that the ideal diet for elderly people will promote insulin sensitivity and adequate levels of cholesterol in the brain. In fact, the ideal diet for neurological health later in life may even be ketogenic. A ketogenic diet helps protect against oxidative stress, one of the major overall mechanisms behind the formation of AGEs, and by definition, it reduces carbohydrate intake to levels that are unlikely to cause insulin resistance. Human studies on ketosis and aging are scarce, but the ones that exist bear this theory out. In one human study, results seem very promising: the researchers tested a group of study subjects with “mild cognitive impairment” (the first stage of neurological diseases like dementia and Alzheimers) for six weeks on either a high carb (50% carbohydrate) or a low carb ketogenic (5-10% carbohydrate) diet. Total calories were not restricted in either group. The ketogenic group improved in every marker they tested: verbal memory, weight, waist circumference, fasting glucose, and fasting insulin. Another study showed an impressive benefit of ketosis for patients with Parkinson’s Disease. What does this suggest for mental and physical health in the elderly? Not the high-carb diet endorsed by the USDA, but rather an insulin-sensitizing diet rich in fatty animal products and relatively low in carbohydrates. Paleo fits this bill to a T. Consumption of ketogenic fats, such as the Paleo-favorite coconut oil, would probably be beneficial even on a diet that doesn’t cause complete ketosis. As discussed in the article on ketosis, there are several ways to see some of the benefits of ketosis without extreme carb restriction; these might be more suitable for seniors who are understandably unwilling to completely overhaul decades of dietary habits overnight. It’s clear that a low- to moderate-carb Paleo diet provides the optimal macronutrient composition and plenty of vital micronutrients for healthy aging. In other words, it’s as healthy for the elderly as it is for everyone else. Unfortunately, the physical and social changes of aging can pose unique challenges to getting enough nutrition, even for people who know what they should be eating. Challenges specific to older adults range from economic circumstances (people on fixed incomes often struggle to afford enough food at all, let alone high-quality meat and vegetables) to painful and ill-fitting dentures that can make eating enough an unpleasant chore. Sometimes, older people with limited mobility struggle to make it to the grocery store, or have to rely on what friends and relatives are willing to bring them. Learning how to cook in new ways at this stage of life is very draining. Older people may also find it more difficult to eat, and loss of appetite is a common symptom of aging. Look into grocery delivery services that let you shop online or by phone and then deliver the food straight to your door. Even Amazon is getting into this game now. Invite friends over to help cook and eat a meal together (and then lend a hand with the cleanup). If chewing vegetables is a challenge, try pureed soups (sweet potato and lime? Cream of tomato? Butternut squash? ), or cook vegetables in soups and stews to make them softer. Experiment with new seasonings to keep your food fresh and interesting. Read the full article on money-saving tips to help you get the most from your grocery dollar: it is possible to go Paleo without breaking the bank! People caring for an older friend or relative can also help by preparing some simple freezer meals that are easy to reheat and enjoy, helping with the groceries and cooking, or just sitting down with your elderly loved ones to enjoy a meal together. Another lifestyle factor that’s incredibly important for maintaining health into old age is exercise. Cranking out a set of tabata sprints might be a young person’s game, but older adults stand to gain a tremendous amount of health and wellness by participating in regular physical activity. Any kind of exercise helps to increase insulin sensitivity, important for avoiding all the complications of diabetes discussed above. Strength training might be even more critical, because it helps maintain healthy bone mass (reducing the danger of osteoporosis) and muscle strength (decreasing the risk of falls). In a recent study, 6 months of light resistance training not only increased muscle mass and strength, but also decreased the amount of time the subjects needed to stand up from a chair, and improved glycemic control and blood lipids. And a study on 40 aging athletes suggested that muscle loss due to aging is partially or even predominantly caused by disuse, rather than some inescapable destiny. Jack LaLanne is an inspiration to all of us, but realistically not everyone can expect to still be lifting weights into our 90s. Walking every day, using very light dumbbells or resistance bands, or enjoying some time in the pool are all safe and practical exercises for older adults, especially people who aren’t in the habit of exercising. Even the best diet and exercise routine in the world can’t make up for lifestyle factors like the increasing isolation and boredom that many elderly people have to cope with. The evidence is absolutely clear on this point: aging patients who have meaningful social interaction do better in every possible marker of health, including physical health, mental well-being, and overall longevity. This is completely consistent with evolutionary history. For most of human existence, people didn’t reach some arbitrary “retirement age” and then suddenly experience a massive change in the way they related to their families and communities. In our culture, we see work as a person’s way of “contributing to society,” so leaving paid employment can make retirees feel useless, burdensome, or just plain bored and lonely with nothing to do. Without the income, sense of identity, and social connections that come with a job, many elderly people are fundamentally disengaged from society. Contrast this with most of human history, where there wasn’t such a sharp distinction between “work” and “life,” and where members of a group continued to make a valued contribution throughout their lives. Among the Hadza, for example, older women are important to the group because they gather a lot of food, freeing up the younger women to spend more time with their children. A person’s sense of value to the community, contribution to the survival of the group, and social connections didn’t drastically change at age 65. All the evidence shows that the social disengagement of modern “retirement” causes serious problems for humans as we age. Isolated people are at higher risk for mental disorders like depression and memory loss, as well as physical diseases, infections, and death. The effect of social life is so strong that one study found that elderly people with the most social connections were three times as likely to be in “very good or excellent health,” whether or not they felt lonely. Considering how closely the mind and body are connected, this shouldn’t be surprising at all. It points to a simple fact about human health: mental and physical well-being are connected. For aging adults, this means that a strong social network and a feeling of making meaningful contributions to the world are just as important as a good diet for healthy aging. Older adults can enjoy all the benefits of social interaction even without participating in the paid labor force. Many people choose to get involved in volunteer activities or charities. Others join recreation centers specifically designed for the elderly, or take classes in arts and crafts, gardening, or other skills. Even a regular date with a group of friends to play cards or enjoy a meal together is a great way to get out of the house and get some human interaction. No “healthy aging” program can completely prevent the inevitable: we’re all going to die at some point. Instead of a quest for immortality, think of diet and lifestyle interventions as a way to achieve “compression of morbidity:” it’s not about the number of years you live, but the number of healthy, active, enjoyable years. It’s about reducing unnecessary hospital visits, stress, and pain. This is not just an issue for the elderly. All of us lose when our parents and grandparents are simply consigned to nursing homes and cut off from the rest of the world, or when our aging loved ones lose years of mental and physical function to poor nutrition and an isolated, sedentary lifestyle. It’s clearly a tragedy for the aging, but it’s almost as bad for the young, who have to live with the social isolation of an increasingly segmented society. Clearly this has been a fairly brief introduction to how Paleo can help prevent the unnecessary trauma of modern aging. There are quite a few specific benefits left unexplored – antioxidants, for example, come to mind. But the main point to take away is that the elderly stand to benefit just as much from an anti-inflammatory, insulin-sensitizing, nutrient-rich diet as the rest of us, and in fact, it might be even more important. Simply put, Paleo is the most effective diet for meeting human nutritional needs, at 30, at 65, or at 90.